People who remember companies like Nash with its slogan of "Give the customer more than he has paid for" will appreciate this Nash themed clock. Car collectors will also love owning a historic reminder of a company known for its introduction of multiple car features which improved the automobile, such as increased stability and air flow. Nash contributed to the development of the classic car era with numerous features, as well as the introduction of the Rambler. 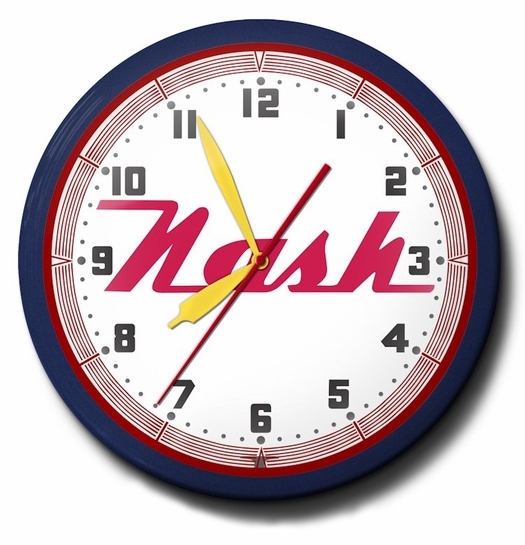 Just like Nash, Image Time's offering of a Nash Motors Neon Clock gives customers more for their money. Image Time is recognized globally for its quality. These clocks are known for providing time keeping accurately over 100,000 hours regularly. Only the finest materials are used to build these beautiful vintage pieces of art which also function as clocks. People who appreciate quality and getting more than their money's worth will enjoy adding this clock to their collection. This Nash Motors Neon Clock is a great gift for anyone who appreciates the history of the automobile or revels in classic cars! No Expedited Shipping option for this Product! Free shipping in US48. Clocks will be shipped via UPS directly to you by the manufacturer within 10-14 business days. Refer to the Specifications Tab for the detailed feature specifications of these clocks. Subject: Neon Clock for Nash Motors's fans and enthusiasts. Ask a question about Nash Motors Neon Clock, High Quality, 20 Inch.